Disneyland turned 60 this summer and to honor the event the park is currently hosting a massive Diamond Celebration that kicked off in May. I visited The Happiest Place on Earth a couple of months ago and the festivities were nothing short of spectacular (though extremely crowded). 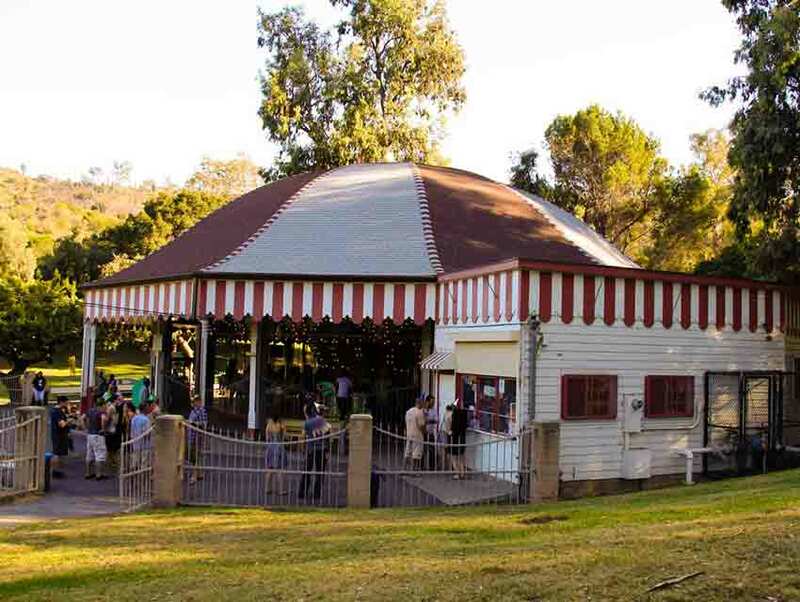 Those wishing to commemorate the anniversary closer to L.A. and throng-free can do so by visiting the Griffith Park Merry-Go-Round at 4730 Crystal Springs Drive. 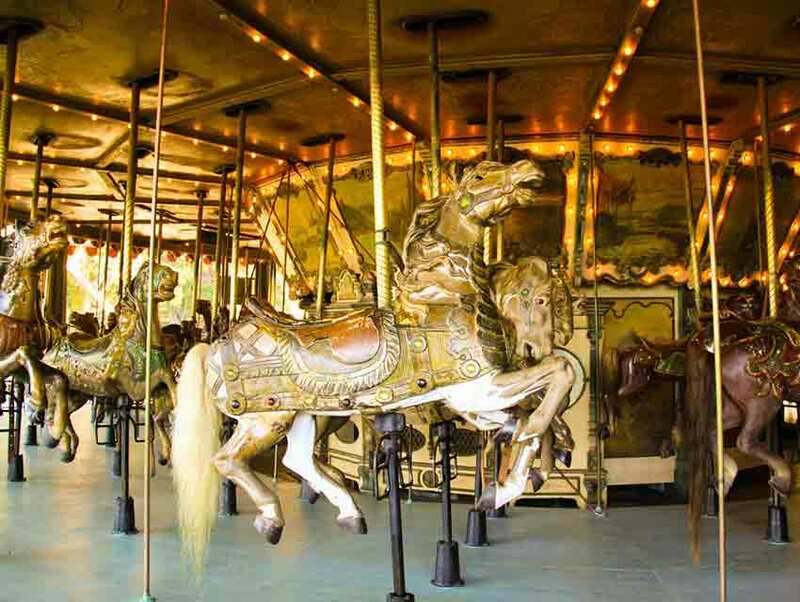 The Griffith Park Merry-Go-Round was built in 1926 by the Spillman Engineering Company. Commissioned by the Spreckels family, it was originally housed at the Mission Beach Amusement Center in San Diego but was moved to its current location in 1937. The merry-go-round is comprised of 68 hand-made horses, all of which jump, and a custom-built Stinson 165 Military Band Organ that plays more than 1,500 songs. It’s the only full-size Spillman carousel still in operation today. Thanks to its nostalgic appeal, the 89-year-old landmark is a wildly popular filming location—so popular, in fact, that it would be impossible for me to chronicle its many onscreen roles here. One of its most famous appearances was in Teen Witch. 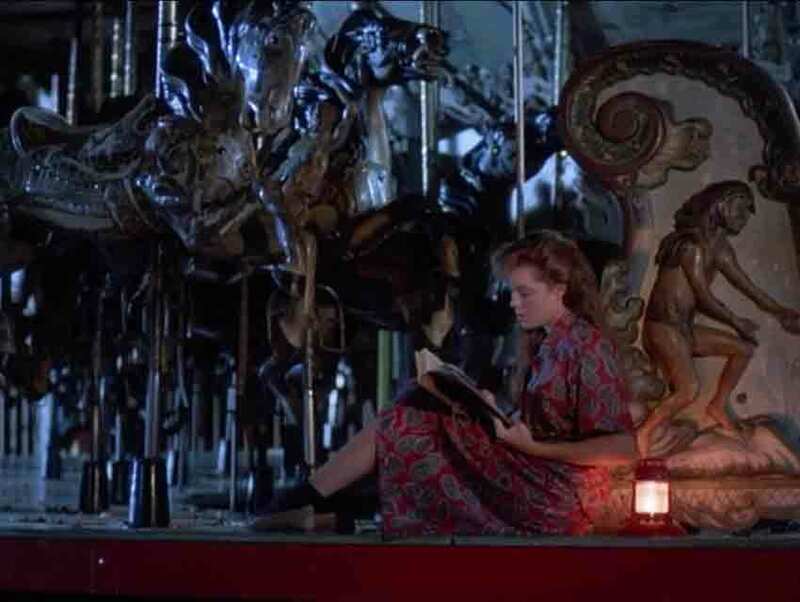 In the 1989 cult favorite, the carousel is where newly-minted witch Louise Miller (Robin Lively) learns how to cast spells to create wind and rain. The Griffith Park Merry-Go-Round is also where Amilyn (Paul Reubens) turns Grueller (Sasha Jensen) into a vampire in Buffy the Vampire Slayer; where Julius and Vincent Benedict (Arnold Schwarzenegger and Danny DeVito, respectively) ride a carousel with their new wives and babies in Twins; and where Patrick Jane (Simon Baker) hypnotizes a young murder suspect in the episode of The Mentalist titled “Seeing Red.” The site has also popped up in the movies Maxie and Beautiful, episodes of MacGyver, CSI: NY, Rizzoli & Isles, Castle, Alias, Knots Landing, Beauty and the Beast, Law & Order: LA, Mod Squad, Melrose Place, House, and The Whole Truth, and in the music videos for Jessica Simpson and Nick Lachey’s song “Where You Are” and Demi Lovato’s “Don’t Forget.” Like I said, the place is a veritable filming institution. The Griffith Park Merry-Go-Round is a nostalgia-inducing gem that, much like Disneyland, is still enjoyed by the young and the young-at-heart decades after its inception.